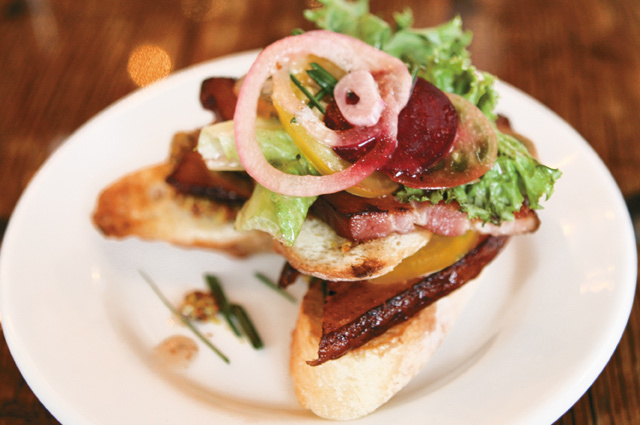 Local, fresh, and delicious: Wise Acre Eatery serves farm-to-plate food in South Minneapolis. The west coast may have beaten Minneapolis to the punch in popularizing local, seasonal and sustainable dining while we were still re-working the corn dog. However, by all reckoning, the locavore movement has settled here, grown roots, and taken over the dining scene. Calling it a trend, I believe, is misguided. Celebrating a close connection from farm to plate is a return to what food has always been, and should always be. Factory farms, frankenfoods and pre-made entrees have had their day in the 20th century. But the new millennium welcomes us back to the garden, where I believe we–a humbler, wiser we–will stay. Wise Acre Eatery owners Scott Endres and Dean Engelmann, who also own the nearby Tangletown Gardens, have made a veritable Eden out of what was once a Standard Oil station. Now a delightful riot of greenery permeates the dining space, to the point that the huge garage doors seem almost whimsical. It’s a pleasant spot to sit and linger, that is, if you can put up with the din of excited diners. Because of the architecture, the noise just has nowhere to go, so it sits like a thick cloud inside the dining room. The servers do their best to talk over it, but even I had to cup my ear just to understand the specials. A noisy dining room is a necessary by-product of the Wise Acre Eatery’s tremendous success to be sure–in fact, expect a 20-minute wait any night of the week. However, if you can steal away one of those beautiful September nights and sit outside, you’re in for a real treat. Endres and Engelmann definitely have capitalized on the new dining movement, but they’ve also taken it a bit further. The Engelmann family farm supplies much of the restaurants produce, to the point that a dish can vary not monthly, not weekly, but daily, according to what’s the freshest. The night’s special was a Fried Green Tomato Sandwich, laced with bacon aioli and layered with arugula and fresh heirloom tomatoes. It’s the kind of sandwich you just may end up eating with a knife and fork, but I probably wouldn’t have it any other way. Even if you’re not a tomato fan, please make an exception if this beauty is on the menu. It’s a rare pleasure to have a dish where every ingredient happens to be peaking at the same time, and what results is a taste that’s difficult to describe. My attempt would be to say that each ingredient is more complementary to the next, working together to create a taste that is constantly changing. And when you eat it, you taste also the knowledge that this same sandwich will not be exactly the same tomorrow. Like your first kiss or your last day of school, it is but a fleeting pleasure, and you must enjoy it now, at this precise moment. With the special, we had been sipping a festive Riondo Prosecco ($6/27). It may be as pink and bubbly as an Edina prom queen, but it was surprisingly robust and well-grounded. With our next course, the Shades of Summer salad ($12), we switched to the Calera “Vin Gris” ($6/27). I’m on a bit of a rosé journey right now, and this chef favorite brought a little sass to the table. The salad was simply exquisite. 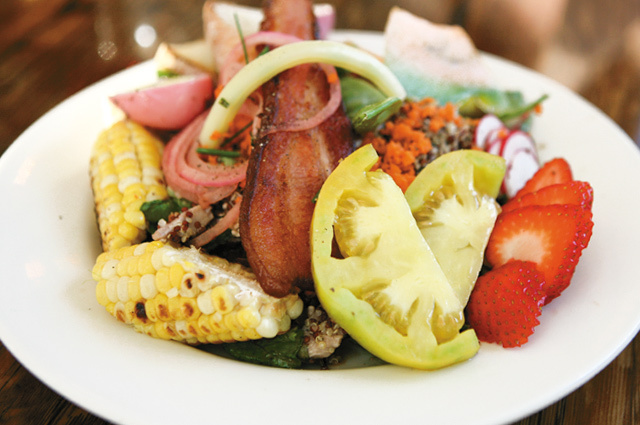 Delicate lettuces, pickled eggs, and a chicken/quinoa salad are oh-so-lightly dressed, and topped with one of Wise Acre’s specialties: bacon steak. I may have been foolish to box up the rest of it–yes, I know salads don’t exactly keep well–but if you eat it, I think you’ll understand. I know that Endres and Engelmann compost the restaurant’s food waste, but I couldn’t bring myself to discard anything on that plate. Bacon Steak & Shallot Marmalade ($7) from the snack menu arrived, stacked high with slices of baguette and heirloom tomatoes. It presented a bit of a challenge for the knife and fork, and so I chose to just eat mine with what the good Lord gave me. A glass of Blue Franc ($6/27) is this snack’s soul mate–warm, inviting and boosting the bacon steak to new heights. After our inspired starters, I thought the Lemon Herb Chicken ($18) needed a little perking up, even with the lemon. The chicken is so wonderfully moist that I am considering that I perhaps just got spoiled with our earlier dishes, and began expecting miracles only to be disappointed with great food. A glass of twitterpated Tiamo Prosecco ($6/28) could have served as dessert, but we also tried a scoop of plum custard ($2.50, Wise Acre inherited Liberty’s custard machine) and the Affagato ($4.50)–vanilla custard with a shot of espresso that will knock your socks off. The kitchen is looking to bring in new desserts soon, but hopefully will keep at least some custard dishes on the menu–homemade custard is such a rare treat. Sitting in this garden of earthly delights, I suddenly became sad to think of the imminent passing of this lovely summer. But thanks to this kitchen, I’m also damn curious about fall. Indeed, the epicures and the food-curious should consider the Wise Acre Eatery’s September 18th multi-course dinner with wine, hosted at the Tangletown Gardens farm in Plato. Tickets are $190, and can be purchased at the Wise Acre Eatery (5401 Nicollet Ave, Mpls) or at the nearby Tangletown Gardens.